After 12 years of representing Germany, the 31-year-old forward has decided to call it quits on the national front. After 12 years of featuring for Germany, Lukas Podolski - former 1. FC Köln and FC Bayern München forward - has announced his retirement from international football; winning the World Cup in 2014. Having grown up in Germany, Podolski qualified for the national team via citizenship, and made his debut in 2004, coming on as a late substitute in a friendly against Hungary, after the then-Polish manager failed to call him up in the prior year. 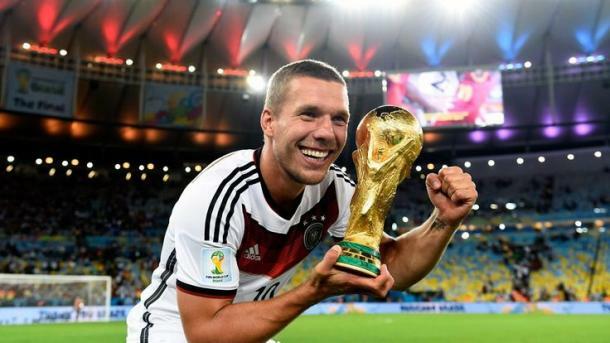 From then on Podolski continued to represent Germany at all major events, including playing in front of home fans in the 2006 World Cup, before winning the prestigious tournament 8 years later in Brazil. His last appearance for die Mannschaft came in a 3:0 win over Slovakia in the knockout stages of Euro 2016 and made a total of 129 appearances, scoring 48 goals. Fellow German internationals, past and present, also gave their best wishes to the 31-year-old. Having spent a total of 14 years at boyhood club 1. FC Köln — aiding the Billygoats’ promotion back to the top tier — with a three-season spell in Bavaria in-between, Podolski joined North London-based side Arsenal FC, winning two FA Cups. A short loan at Serie A giants Inter Milan followed, before a permanent move to current club Galatasaray SK materialised. Podolski follows former Bayern stars Miroslav Klose, Philipp Lahm and, most recently, Bastian Schweinsteiger in quitting the national team.